World's finest apps do not always come perfect. And that does not exempt Spotify, our personal favorite music streaming app. Spotify's latest iOS app is still deprived of the most sought-after functionality as a music app: a sleep timer. You cannot fall off to sleep while Spotify is playing in the background as it will obviously drain your battery. You don't want to get up in the morning with your phone's battery dead, right? In this post, I'm going to show you how you can easily add that Sleep Timer functionality to your Spotify iOS app so you can still sleep to your favorite tracks without leaving your iPhone/iPad's battery dead empty. As I mentioned above, Spotify's iOS client doesn't have a sleep timer functionality bundled to the app as yet. So we'll be taking refuge to another app called Music Sleep Timer to do job. 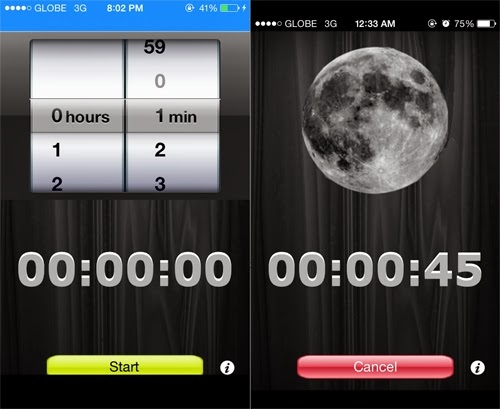 Music Sleep Timer is just another FREE iOS app designed to kill any media playback active on your iPhone or iPad. It works exactly like the sleep timer on your TV or airconditioner. Just launch Spotify, set the timer and sleep to your favorite tunes. Music Sleep Timer is not only useful to Spotify. You can also use it to other music apps like Pandora or any podcast or audiobook apps. 2 Once installed, open Spotify & begin playing. 3 Press the Home button to send the music player into the background. IMPORTANT: Be sure to leave Music Sleep Timer active in the foreground for the sleep timer to work. While waiting for Spotify to finally bring the most-coveted sleep timer functionality in their next update, you may try Music Sleep Timer to temporarily do just that.